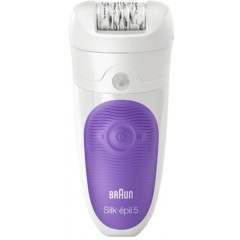 The Braun Silk-épil 5 epilator is the ideal tool for women who are new to epilation. Close-Grip technology with 40 tweezers for ultra smooth and long-lasting results. For a comfortable epilating experience, the high frequency massage system effectively soothes the plucking sensation for ultimate skin comfort. The Silk-épil 5 epilator is designed for efficient, long-lasting and extra gentle hair removal, the new Silk-épil 5 is ideal for women who are new to epilation. It includes Close-Grip technology with 40 tweezers that even remove short and fine hair. 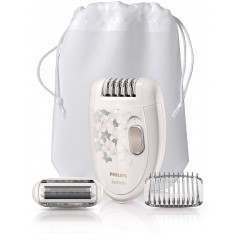 It also has a Comfort System with massage rollers that stimulate the skin, plus a cooling glove to soothe after epilation. High frequency massage - The high frequency massage system stimulates the skin and effectively soothes the plucking sensation during epilation to maximize your skin comfort. Cooling glove - The cooling glove effectively cools the skin before and soothes it after epilation to further increase your comfort. 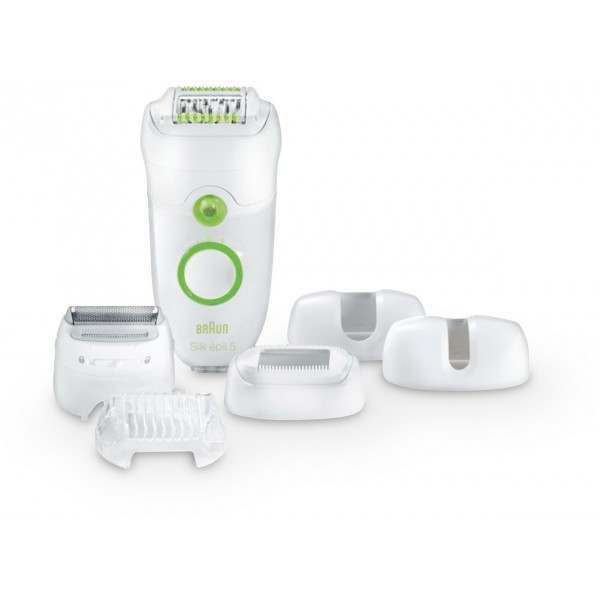 Features dermatologically recommended - The Silk-épil 5 Power epilator is recommended* as the gentle solution to long-lasting hair removal thanks to its unique combination of skin-soothing features. Close-grip technology - The 40 tweezers have been engineered to close at the optimal angle and grip hair even closer to the skin for better removal of even the shortest hairs (0.5mm). Pivoting head - Better adaptation to the contours of the body for more comfort and maximum thoroughness. SoftLift Tips® - Effectively lift even flat-lying hair and help guide them to the tweezers for removal. Smartlight - Helps easily guide your way through the epilation process and lightens up even the finest hairs for no miss removal. Fully washable - The entire device can be cleaned under running water for better hygiene. Speed personalization - Select the right speed for your individual needs: Speed 1 for extra gentle epilation, speed 2 for extra efficient epilation. Evenings are the right time for epilation; you’re more relaxed, and any minor bumps will be gone by the morning. The preparation includes exfoliation in a warm shower. It will leave your skin clean and relaxed and helps to reduce those dreaded in-grown hairs. 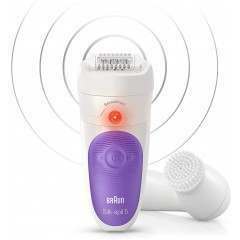 Use an exfoliation scrub or mitt, or we recommend our Braun Silk Epil SkinSpa exfoliating brush for 4x better results than a manual peeling. When epilating, hold your epilator so that it feels natural. 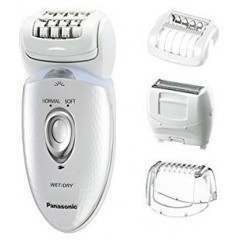 Hold at a 90 degree angle to your legs and run the epilator in an upward motion, against the direction of hair growth. 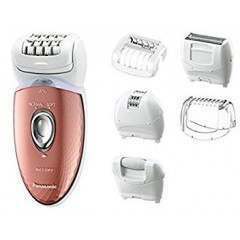 There’s no need to press down too hard, simply touch the epilator lightly on the skin. 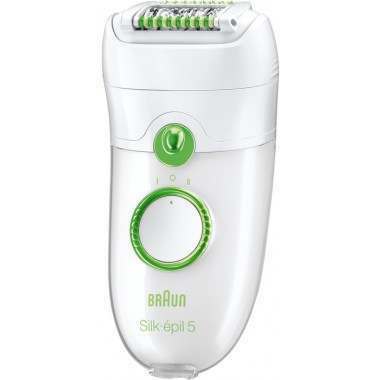 Braun Silk Epil’s cooling glove and massaging rollers help to minimise discomfort, and with regular use, epilation becomes virtually painless. The golden rule is to moisturise after epilation, not before. Apply body lotion for better results and get set for soft, silky skin in the morning.